Alterna Haircare's Caviar Restructuring Bond Repair Duo Gift Set is a duo of their best-selling, high performance Shampoo and Conditioner from their Caviar Restructuring Bond Repair collection beautifully packed in a Christmas themed gift box. The Caviar Repair collection is clinically proven to reduce breakage by 95%, with instant improvements in strength, frizz control, softness & shine. 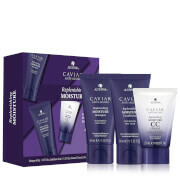 All Caviar Repair products are formulated with Strand-Building Proteins to rebuild, resurface and restore each individual strand of hair from the inside out. Hair is left damage-free. A restorative, sulphate-free shampoo infused with Caviar & Strand-Building Proteins that mimic hair's natural ceramides to help repair damaged strands. A restorative, sulphate-free conditioner infused with Caviar & Strand-Building Proteins that mimic hair's natural ceramides to help repair damaged strands. Shampoo: Massage throughout wet hair and rinse thoroughly. 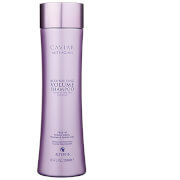 For best results follow with Caviar Restructuring Bond Repair Conditioner. 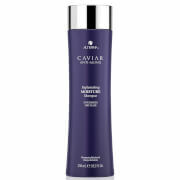 Conditioner: After shampooing with Caviar Restructuring Bond Repair Shampoo, massage conditioner throughout wet hair and rinse thoroughly. Shampoo: Water (Aqua), Disodium Laureth Sulfosuccinate, Sodium Lauroyl Methyl Isethionate, Cocamidopropyl Betaine, Sodium Lauroyl Sarcosinate, Cocamidopropyl Hydroxysultaine, Cocamidopropylamine Oxide, Glycol Distearate, Glycereth-26, Hydrolyzed Vegetable Protein PG-Propyl Silanetriol, Caviar Extract, Polysilicone-15, Ascorbic Acid, Superoxide Dismutase, Tocopheryl Acetate, Polyquaternium-7, Hydrolyzed Rice Protein, Butyrospermum Parkii (Shea) Butter, Acrylates/Vinyl Neodecanoate Crosspolymer, Algae Extract, Phospholipids, Helianthus Annuus (Sunflower) Seed Oil, Linum Usitatissimum (Linseed) Seed Oil, Saccharomyces/Magnesium Ferment, Saccharomyces/Copper Ferment, Saccharomyces/Silicon Ferment, Saccharomyces/Zinc Ferment, Saccharomyces/Iron Ferment, C12-13 Pareth-23, C12-13 Pareth-3, Amodimethicone, C11-15 Pareth-7, Laureth-9, Divinyldimethicone/Dimethicone Copolymer, PEG-45M, Glycerin, Decyl Glucoside, Dihydroxypropyl PEG-5 Linoleammonium Chloride, Behenyl/Stearyl Aminopropanediol Esters, Butylene Glycol, Trideceth-12, Aminomethyl Propanol, Hydroxypropyl Guar Hydroxypropyltrimonium Chloride, Citric Acid, Disodium EDTA, Methylchloroisothiazolinone, Methylisothiazolinone, Phenoxyethanol, Fragrance (Parfum), Geraniol, Hexyl Cinnamal, Limonene, Linalool. Conditioner: Water (Aqua), Cetearyl Alcohol , Cyclopentasiloxane, Behentrimonium Chloride, Cetrimonium Chloride, Behentrimonium Methosulfate, Divinyldimethicone/Dimethicone Copolymer, Behenyl/Stearyl Aminopropanediol Esters, Caviar Extract, Hydrolyzed Vegetable Protein PG-Propyl Silanetriol, Algae Extract, Superoxide Dismutase, Polysilicone-15, Saccharomyces/Magnesium Ferment, Saccharomyces/Copper Ferment, Saccharomyces/Silicon Ferment, Saccharomyces/Zinc Ferment, Saccharomyces/Iron Ferment, Jojoba Esters, Dimethiconol, Ascorbic Acid, Hydrolyzed Rice Protein, Phospholipids, Cetrimonium Bromide, Butyrospermum Parkii (Shea) Butter, Glycerin, Tocopheryl Acetate, Linum Usitatissimum (Linseed) Seed Oil, Helianthus Annuus (Sunflower) Seed Oil, C12-13 Pareth-23, Butylene Glycol, C11-15 Pareth-7, Trideceth-12, Amodimethicone, C12-13 Pareth-3, Laureth-9, Glycereth-26, Guar Hydroxypropyltrimonium Chloride, Citric Acid, Disodium EDTA, Phenoxyethanol, Methylchloroisothiazolinone, Methylisothiazolinone, Fragrance (Parfum), Limonene, Linalool, Hexyl Cinnamal, Geraniol.